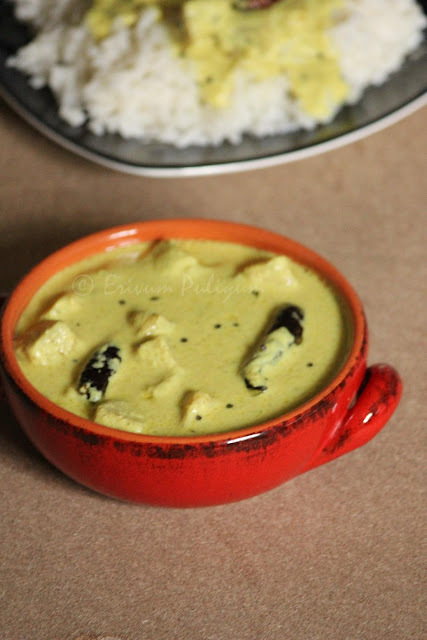 Nendrakai Kalan is a rich delicious curry mainly served in sadyas(vegetarian traditional feast) during Onam,Vishu or marriages.This is a coconut & yogurt based curry that serves best with steamed rice.The main spice flavors in this curry is from the pepper powder and green chillies.There are many variations to kalan like kurukku kalan ,katti kalan,etc.I love all coconut & yogurt based curries with rice ,its a complete satisfying meal and so is this recipe.As Keralites have Vishu(Kerala festival) coming up next month,this recipe can be a helping guide to many who wish to prepare their own at home.Enjoy making this at home !!! Peel and chop the plantains in cubes,leave soaked in water. Mix the pepper powder in 1 1/2 cups water and sieve the mixture.Pour this mixture in a pan and add turmeric powder. Add the chopped plantain and bring to a boil.Let it cook till tender about 7-8 mins.Add few curry leaves. In the meantime,grind the coconut,cumin seeds & green chillies to a smooth paste.Add this paste to the pan and let one or two bubbles appear at the surface.Put off heat,add in the fenugreek powder and ghee. In another pan,heat oil.Splutter mustard seeds.Add the curry leaves and dry red chillies.Put off flame and add the seasoning to the curry. * The yogurt should be sour,otherwise it may not bring out the actual flavors in the curry. * Adding fenugreek powder enhances the flavors of the curry. * You can even add chopped yam to this curry.But yam takes lesser time to cook so add accordingly . * Keep the flame low,once you add the yogurt or else it may curdle. * Add a piece of yam too if you have, which adds to the consistency and taste. Love the color of the gravy. yummy. Onam sadyas are the best. I had been to Coconut Groove in Bangalore during Onam festival and had a nice & light meal with a friend!! Love the texture of this curry & it reminds me of moor kulambu!! Love it!! Great with rice, need nothing else as a side dish. I love kerala dishes and this looks so good.made me hungry instant. love kalan. yours look delicious. never tried with plantain.thanks for sharing.lovely clicks. 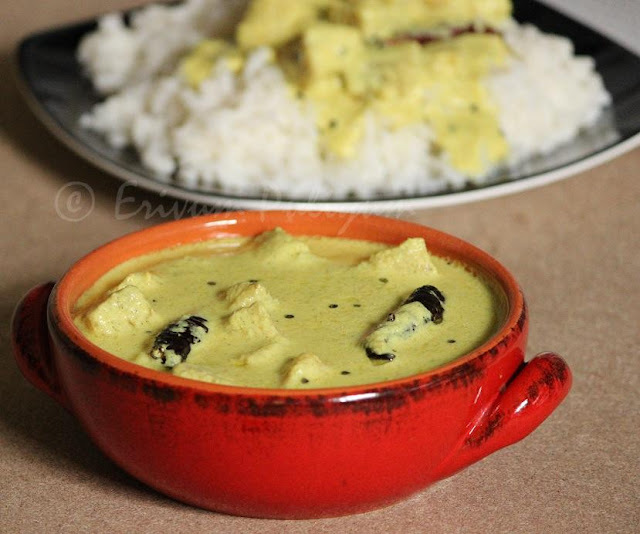 Looks really delicious, I am the great fan of kerala recipes.. I like the way you have made the pictures look interesting. Nice dish too. Yummy and healhty curry..I always love coconut based curry. ur photos are so tempting dear.. Beautifully done, who can resist to this wonderful, flavourful curry. My all time favourite dish :) Your preparation looks fabulous & perfectly prepared too! I remember eating it as a child but have never made it myself. Looks delicious! 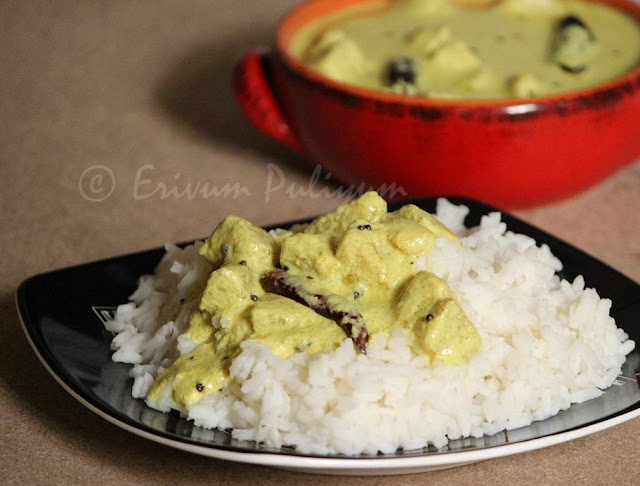 healthy and delicious curry... yumm..
Looks yum, I always love kerala sides. Delicious kalan, such a comforting food. Will try the same curry in fish recipe !!!! Love the lovely colour of the gravy, new dish for me!! I too love this one Julie.. Rich & tasty.. But u said sieve the mixture.. Why that? Just have my mouth water all day long- thank you for that, Julie!